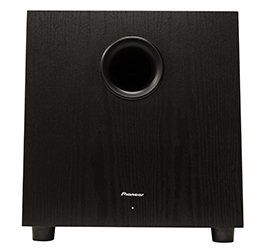 Designed to fill the room with deep, powerful bass essentials, the Pioneer SW-10 Powered Subwoofer conveys the weight and realism contained in dynamic music and soundtracks. 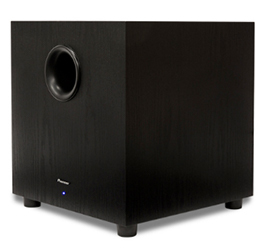 The SW-10 Powered Subwoofer features a 10” long-throw down-firing woofer housed in a vented and stylish enclosure to improve transient response. 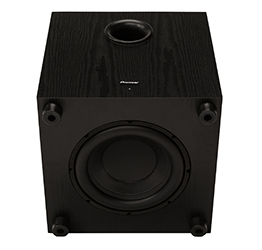 Using a wide rubber surround rather than a more cost effective foam surround, the SW-10 achieves far better excursion of the cone that provides more bass response in a smaller cabinet. Plus, rubber does not degrade over time like foam so the bass driver provides consistent bass response longer, ensuring your woofer performs superlatively for the entire life of your home entertainment system. This product is covered by a One-Year Warranty.